Sikeston farmer Trey Wilson said he saw substantial damage to his soybean crops this year. 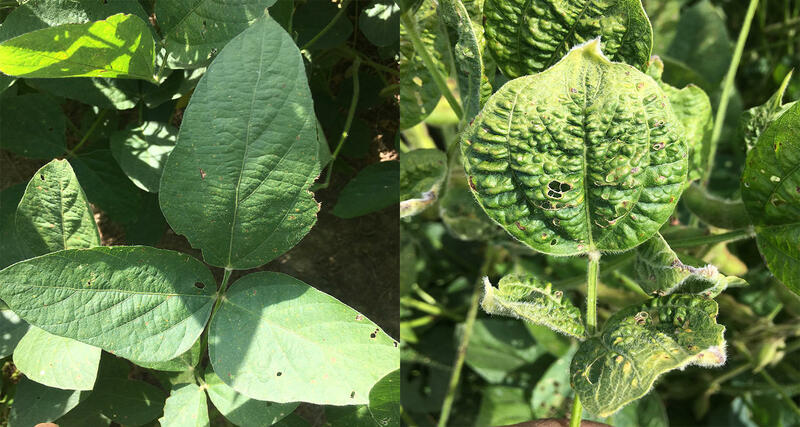 On the left is what a healthy soybean plant looks like; on the right is a soybean plant showing signs of dicamba damage. Hamra, president and founder of Amanzi Farms, hopes to expand its operations to Kansas City and Springfield. But he’s worried that his vegetables could be damaged by the herbicide dicamba, which some neighboring farms are using. The chemical is sold under brand names, such as Monsanto’s XtendiMax, BASF’s Engenia and DuPont’s FeXapan. It’s very effective at killing pigweed, a tough plant that many soybean farmers grapple with. However, it’s hard to control, since it turns into a gas in hot weather and can drift miles off target, causing damage to sensitive crops. Steve Hamra, president and founder of Sikeston, Mo-based Amanzi Farms, stands next to some of the vegetable seedlings he's planning to grow hydroponically. He worries they'll be vulnerable to dicamba drift. Farmers have used dicamba since the 1960s. But it’s become more widely used because last year, Monsanto began selling soybean and cotton varieties that contain the dicamba-tolerant Xtend trait. “In the past year, we had just incredible complaints throughout June, July and August,” said Kevin Bradley, a plant sciences professor at the University of Missouri-Columbia. St. Louis Public Radio's Eli Chen reports on the stress some farmers are feeling about the next growing season, due to the high number of reports regarding dicamba-based herbicide damage. The Missouri Department of Agriculture is investigating about 300 cases of dicamba-related complaints, most of them occurring in the southeast part of the state, where Amanzi Farms is located. However, Bradley said that the extent of damage is likely greater than what farmers are rep to the state. His research estimates that dicamba has injured more than 320,000 acres of soybeans in Missouri this year. Dicamba’s movements can be influenced by wind, temperature and the formulation’s volatility. Bradley said researchers and companies are debating how much any of these factors play a role in the damage the chemical has caused. Also, farmers historically have applied dicamba to their fields during the spring. Scientists are trying to understand how its growing use during the summer affects crops that are vulnerable to injury. “I just don’t think we know enough yet to apply this safely,” Bradley said. Meanwhile, the controversy over dicamba has created much tension and division between farmers, particularly between growers use dicamba-based herbicides and growers whose crops have been harmed by them. Trey Wilson, whose farm is located near Amanzi Farms, said he saw substantial damage to his soybeans this year. Also, the heirloom tomatoes he planted in a new greenhouse had stopped growing for a month, “almost as if someone had pushed the ‘pause’ button.” He is considering taking legal action. Wilson won’t know until how much dicamba affected his soybean yield until he’s finished with the harvest, but depending on the result, he may have to buy seeds from Monsanto to avoid losses next year. Hamra expressed frustration that specialty crop farmers like him don’t have many options and have to brace themselves for potential damage. Wilson and Hamra think that dicamba should be banned. 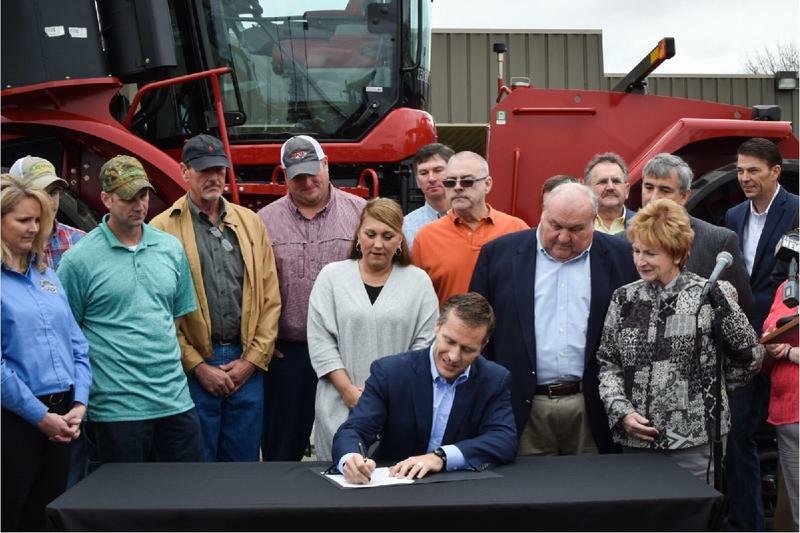 Arkansas and Missouri have placed temporary bans on the sale and use of dicamba-based products this summer, though Missouri’s was lifted after only a few days. While the Environmental Protection Agency has approved the chemical for use next year, but federal officials are considering limits on when farmers can spray it. On behalf of several farmers in 10 states, including Missouri and Illinois, a law firm has filed a class action lawsuit against Monsanto. The main allegation is that the agriculture company knowingly sold a crop that did not have any approved herbicide to go along with it in 2015 and 2016. As a result, farmers who planted Monsanto’s Xtend cotton and soybean seed used dicamba, an illegal herbicide, to avoid damage to the crops.